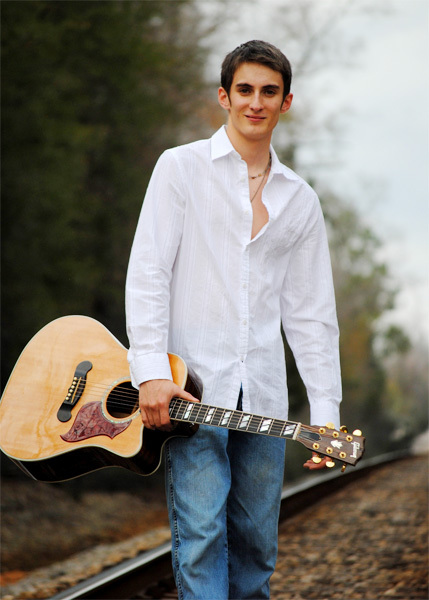 A North Escambia resident has signed a Nashville recording contract. Dusty Sanderson, 20, has signed with Lamon Records Nashville. 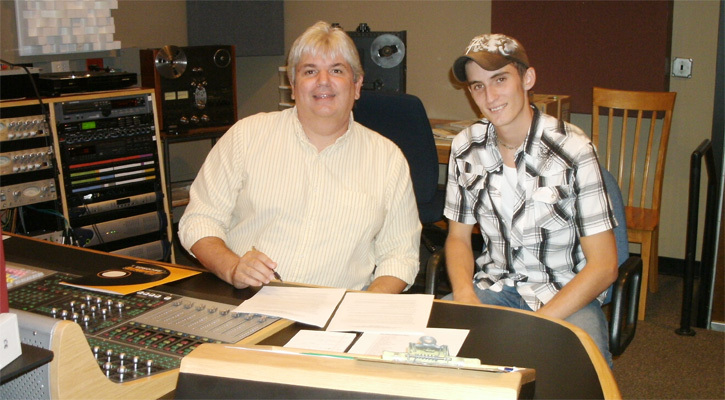 He was in Quad Studios in Nashville recently recording original songs for his upcoming EP release, which should hit the street early in 2013. Suddenly, the young aspiring artist was landing professionally paying gigs at all the bars and clubs in the area. His deep baritone voice is reminiscent of great country singers like Vern Gosdin or Lefty Frizzell, yet he makes every song his own. Asked about his songwriting, Dusty says, “I’ve been interested in writing songs all my life, but I didn’t get serious about it until I was 17. I had a girlfriend that I spent all day, every day with, so when she took a trip to LA for a week I had no clue what to do with my time, so I sat down in my room and started writing.” And he’s not stopped since. Pictured top: Dave Moody, president of Lamon Records, and Dusty Sanderson in Nashville. Submitted photo for NorthEscambia.com, click to enlarge. Your Light in the Lime light is brighten up our part of the world !!! He is great! i seen him multiple times! goodluck Dusty!!!! Congratulations Dusty, watch your diet and get plenty of rest. Good Luck! I live outside Nashville now, so if anybody knows where he will be playing I would like to know. Be nice to support a local kid here. It can be a tough place to play and survive. Dusty, I am so happy for you and your family. I have known your parents and uncles for years, as I worked with them……talented family. I will keep up with your success and always remember the time you and your band played for my son’s 40th birthday party…… in our back yard (January, 2012). I told you guys then we would remember you as you became famous and you are on your way! WTG Dusty ! I remember when Amber ( Austin’s sister ) got you your gig at The Worm ! I am so excited for you ! I remember seeing you and Austin at Amber and Russell’s house playing on the back porch ! When I first heard you, I knew you had it in you … I said to myself ” That young boy is good ” YAY !! Congratulations Dusty!!! Way to Go!!!! Can’t wait to purchase your CD! Way 2 Go Dusty! You Have A Real Talent! I Know Every1 Is Sooo Proud Of You! && I Know There Is A Bunch Of Us Who Can’t Wait To See You Make It Big So We Can All Sit Back && Remanence On The Ol Days W/ You && You Guitar By A Bon Fire! very proud to have one of our own make it big!! !…(BIG smile) ..hope that he has a very good agent who will look out for his best interest! Im so proud of you baby!!!!! All of your hard work is finally paying off! Keep your head high and remember ill be right beside you every step of the way!!! !I LOVE YOU!!!! Congrats Dusty you did it we are all so proud of you. I grew up with Dusty, he was always toating that guitar around, he definitly has done a great job making it on his own! Cant wait till he is famous because he definitly deserves it! It’s so awesome to see such talent being rewarded. I wish Dusty nothing but the best. I know how proud you, John and your wife are. So glad that I’ve had the opportunity to see his shows and plan to see many more in the future. Congrats!!!! This is awesome! I have seen Dusty play a few times through East Hill Guitar Instruction student concert events in Pensacola and each time I was very impressed. The first time I heard Dusty sing, I looked at my wife and said that he had something special going and we would see him again in the future. He has wonderful guitar skills and an incredible voice. Congratulations to Dusty! Way to go Dusty, you got it babe, show ‘em what it is all about! Way to go Dusty…John I know you and your wife are over the moon. Congrats!!! !